Use as an auxiliary out-feed slot for fabricated tables. Allows primary slide (G202S) or standard miter guages to slide effortlessly. Guide groove in the heavy base to center drill and countersink for secure mounting. Anodized for low sliding friction. Available in 24", 32", 48" and 98" lengths. See above Docs link for other 3/4" Material sections. 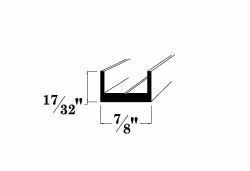 Use for creating work top miter slots. Satin Anodized for low sliding friction.